On account of a strong increase in foreign direct investment (FDI) flows to developing countries, 2004 saw a slight rebound in global FDI after three years of declining flows. At $648 billion, world FDI inflows were 2% higher in 2004 than in 2003. Inflows to developing countries surged by 40%, to $233 billion, but developed countries as a group experienced a 14% drop in their inward FDI. 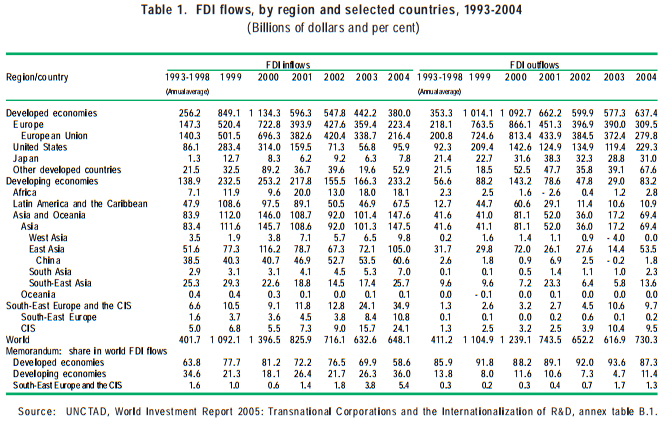 As a result, the share of developing countries in world FDI inflows was 36% (table 1), the highest level since 1997. The United States retained its position as the number one recipient of FDI, followed by the United Kingdom and China (figure 1). FDI outflows increased in 2004 by 18%, to $730 billion, with firms based in developed countries accounting for the bulk ($637 billion). In fact, almost half of all outward FDI originated from three sources: the United States, the United Kingdom and Luxembourg in that order (figure 1). Developed countries as a group remained significant net capital exporters through FDI; net outflows exceeded net inflows by $260 billion. While FDI outflows from the European Union (EU) declined by 25%, to $280 billion (a seven-year low), most other developed countries increased their investment abroad. In the case of the United States, outflows increased by over 90%, to $229 billion, a record high. The stock of FDI in 2004 is estimated at $9 trillion. It is attributed to some 70,000 transnational corporations (TNCs) and their 690,000 affiliates abroad, with total sales by foreign affiliates amounting to almost $19 trillion (table 2). 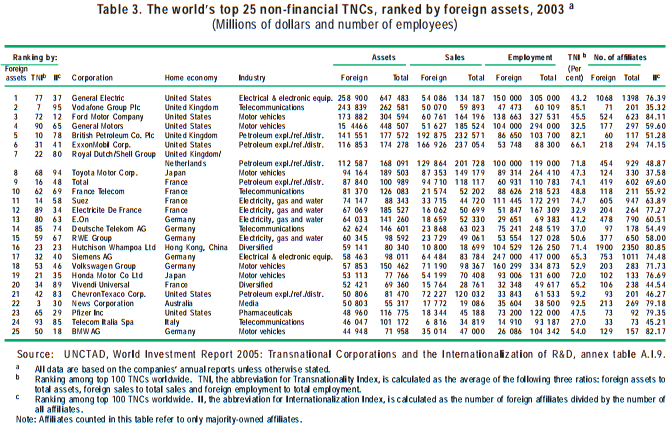 Ranked by foreign assets, General Electric (United States) remained the largest non-financial TNC worldwide, followed by Vodafone (United Kingdom) and Ford Motor (United States) (table 3). Among the top 100 TNCs worldwide, four companies, led by Hutchison Whampoa (Hong Kong, China), are based in developing economies (table 4). The pace at which the top 100 TNCs are expanding internationally appears to have slowed down. Although their sales, employment and assets abroad all rose in absolute terms in 2003, their relative importance declined somewhat as activities in the home countries expanded faster. Japanese and United States TNCs are generally less transnationalized than their European counterparts. The top 50 TNCs based in developing economies (table 4), with a shorter history of outward expansion, are even less transnationalized, but the gap between TNCs from developed and developing countries is shrinking in this respect. International investment in services, particularly financial services, continued to grow steadily, accounting for the bulk of the world FDI stock. The services sector accounted for 63% of the total value of cross-border M&As in 2004, with financial services responsible for one-third of the value of cross-border M&As in this sector. For the first time, this year’s WIR ranks the top 50 financial TNCs. Large TNCs dominate world financial services, not only in terms of total assets but also in terms of the number of countries in which they operate. Citigroup (United States) tops the list, followed by UBS (Switzerland) and Allianz (Germany). Financial TNCs from France, Germany, Japan, the United Kingdom and the United States accounted for 74% of the total assets of the top 50 financial TNCs in 2003. Low interest rates, higher profits and the recovery of asset prices, principally in developed countries, contributed to an upturn in M&As, including cross-border M&As; their value shot up by 28% to $381 billion. These transactions played an important part in the continued restructuring and consolidation process of many industries, especially in the developed world. The largest M&A deal in 2004 was the acquisition of Abbey National (United Kingdom) by Santander Central Hispano (Spain), valued at $16 billion. In developing countries, cross-border M&As accounted for a more modest share of overall FDI activity, although firms from these countries were increasingly involved in M&As, including some high-profile cases. The upswing in FDI flows to developing countries was mainly associated with greenfield investments notably in Asia. China and India together accounted for about a half of all new registered greenfield (and expansion) projects in developing countries in 2004. In terms of the three main forms of FDI financing, equity investment dominates at the global level. During the past decade, it has accounted for about two-thirds of total FDI flows. The shares of the other two forms of FDI — intra-company loans and reinvested earnings — were on average 23% and 12% respectively. These two forms fluctuate widely, reflecting yearly variations in profit and dividend repatriations or the need for loan repayment. There are notable differences in the pattern of FDI financing between developed and developing countries; reinvested earnings are consistently more important in the latter. FDI continues to surpass other private capital flows to developing countries as well as flows of official development assistance (ODA). In 2004, it accounted for more than half of all resource flows to developing countries and was considerably larger than ODA. However, FDI is concentrated in a handful of developing countries, while ODA remains the most important source of finance in a number of other developing countries. This is particularly the case for most least developed countries (LDCs) even though FDI flows have surpassed ODA for individual countries in that group. Countries continue to adopt new laws and regulations with a view to making their investment environments more investor friendly. Out of 271 such changes pertaining to FDI introduced in 2004, 235 involved steps to open up new areas to FDI along with new promotional measures (table 5). In addition, more than 20 countries lowered their corporate income taxes in their bid to attract more FDI. In Latin America and Africa, however, a number of policy changes tended to make regulations less favourable to foreign investment, especially in the area of natural resources. At the international level, the number of bilateral investment treaties (BITs) and double taxation treaties (DTTs) reached 2,392 and 2,559 respectively in 2004, with developing countries concluding more such treaties with other developing countries. More international investment agreements were also concluded at the regional and global level, potentially contributing to greater openness towards FDI. The various international agreements are generally becoming more and more sophisticated and complex in content, and investment-related provisions are increasingly introduced into agreements encompassing a broader range of issues. There is also a rise in investor-State disputes, paralleling the proliferation of international investment agreements. …with the Asia and Oceania region the largest recipient as well as source of FDI among developing countries. 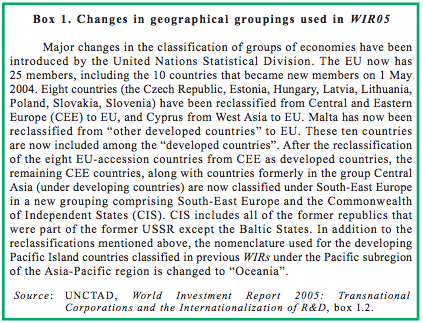 The upturn in global FDI was marked by significant differences between countries and regions (figure 2 and table 1). Asia and Oceania (for definition, see box 1) was again the top destination of FDI flows to developing regions. It attracted $148 billion of FDI, $46 billion more than in 2003, marking the largest increase ever. East Asia saw a 46% increase in inflows, to reach $105 billion, driven largely by a significant increase in flows to Hong Kong (China). In South-East Asia, FDI surged by 48% to $26 billion, while South Asia, with India at the forefront, received $7 billion, corresponding to a 30% rise. FDI inflows to West Asia grew even more, rising from $6.5 billion to $9.8 billion, of which more than half was concentrated in Saudi Arabia, the Syrian Arab Republic and Turkey. China continued to be the largest developing-country recipient with $61 billion in FDI inflows. The Asia and Oceania region is also emerging as an important source of FDI. In 2004 the region’s outward flows quadrupled to $69 billion, due mainly to dramatic growth in FDI from Hong Kong (China) but also to increased investments by TNCs from other parts of East Asia and SouthEast Asia. 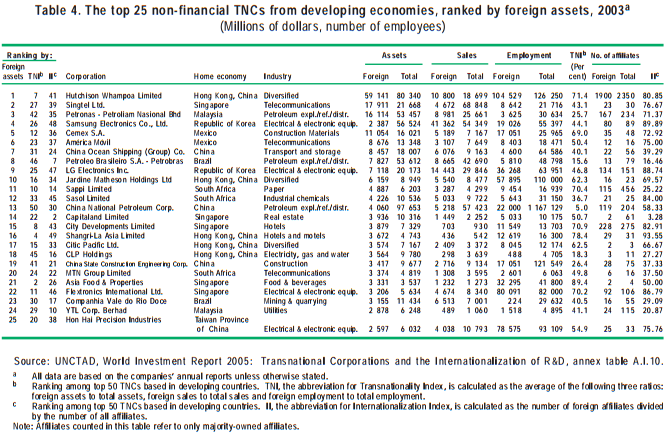 Most of these investments are intraregional, taking place especially among the economies of East and South-East Asia. However, interregional investment from Asian economies also increased. For example, a key driver of Chinese outward FDI was the growing demand for natural resources. This has led to significant investment projects in Latin America. Indian TNCs also invested large amounts in natural resources in other regions, primarily in African countries and the Russian Federation. Asian investment in developed countries is on the rise as well: the past year in particular has seen a few sizeable acquisitions of United States and EU firms by Chinese and Indian TNCs — such as the acquisition by Lenovo (China) of the personal computers division of IBM (United States). The growth of both inward and outward FDI flows in Asia and Oceania is being facilitated by various policy changes at the national and regional levels. For example, the Association of Southeast Asian Nations (ASEAN) and China signed an agreement to establish a free trade area by 2010, and several Asian countries signed free trade agreements with the United States. Following four years of continuous decline, FDI flows to Latin America and the Caribbean registered a significant upsurge in 2004, reaching $68 billion — 44% above the level attained in 2003. Economic recovery in the region, stronger growth in the world economy and higher commodity prices were contributing factors. Brazil and Mexico were the largest recipients, with inflows of $18 billion and $17 billion respectively. Together with Chile and Argentina they accounted for two-thirds of all FDI flows into the region in 2004. However, FDI inflows did not increase in all the countries of Latin America. There were notable declines in Bolivia and Venezuela, mainly linked to uncertainty regarding legislation related to oil and gas production. In Ecuador the completion of the crude oil pipeline construction explained the decrease in FDI inflows. A number of countries modified their legislation and tax regimes to increase the State’s share in revenues from non-renewable natural resources. It is still too early to assess the impact of these changes on the volume of FDI. Significant projects remain under development and additional ones were announced during 2004. The sectoral composition of inward FDI to parts of Latin America and the Caribbean appears to be changing. For several countries of the region, natural resource and manufacturing industries became more popular FDI destinations than services in 2004. In Argentina, Brazil and Mexico, manufacturing attracted more FDI than services. FDI in Mexico’s maquiladora industry surged by 26% in response to growing demand in the United States after three consecutive years of decline. The completion of most privatization programmes, coupled with financial difficulties facing foreign investors in the aftermath of the recent financial crisis and the ensuing economic stagnation in some countries, reduced the attractiveness of the services sector for FDI in Latin America. Firms in that sector suffered the most from the impact of the economic crisis, facing serious problems in reducing their large foreign-currency liabilities while at the same time being unable (owing to the non-tradability of their activities) to shift towards export-oriented production. In Central America and the Caribbean, however, renewed privatization activity made services the largest FDI recipient sector. In the Andean Community, high oil and mineral prices sustained the position of the primary sector as the main recipient of FDI flows. FDI flows to Africa remained at almost the same level — $18 billion — as in 2003. FDI in natural resources was particularly strong, reflecting the high prices of minerals and oil and the increased profitability of investment in the primary sector. High and rising prices of petroleum, metals and minerals induced TNCs to maintain relatively high levels of investment in new exploration projects or to escalate existing production. Several large cross-border M&As were concluded in the mining industry last year. Despite these developments Africa’s share in FDI flows worldwide remains low, at 3%. Angola, Equatorial Guinea, Nigeria, Sudan (all rich in natural resources) and Egypt were the top recipients, accounting for a little less than half of all inflows to Africa. While FDI inflows to the last three rose, those to South Africa, another important FDI recipient, fell. LDCs in Africa received small amounts: around $9 billion in total in 2004. Most investment in Africa originated from Europe, led by investors from France, the Netherlands and the United Kingdom, and from South Africa and the United States; together these countries accounted for more than half of the region’s inflows. FDI outflows from Africa more than doubled in 2004, to $2.8 billion. A renewed wave of FDI-friendly measures and initiatives at national and international levels has sought to facilitate and attract more FDI to the African continent. At the national level, many measures focused on liberalizing legal frameworks and improving the overall environment for FDI. However, failure to move rapidly on economic and social policies important for attracting and retaining FDI, and a weak emphasis on capacity building, have hampered the ability of many countries in the region to attract FDI, in particular in manufacturing. Thus far, international market-access measures and initiatives targeting African countries (such as the United States’ African Growth and Opportunity Act) overall have not been very successful in increasing FDI. In order to realize the potential for increased FDI and to derive greater benefits from it, African countries generally need to develop stronger industrial and technological capabilities. The need for international support to Africa’s development has been stressed in several recent initiatives. For example, the Commission for Africa (established by the United Kingdom) released a report in March 2005 recommending a substantial increase in aid to Africa: an additional $25 billion per year to be implemented by 2010. It also proposed several measures that could help the continent attract more FDI and enhance its benefits for development. Specifically the report called for donors to double their funding for infrastructure, adopt a 100% external debt cancellation, support an Investment Climate Facility for Africa under the New Economic Partnership for Africa’s Development (NEPAD) initiative, and create a fund that would provide insurance to foreign investors in post-conflict countries in Africa. FDI inflows to South-East Europe and the CIS, a new group of conomies under the United Nations reclassification (box 1), recorded a fourth year of growth in 2004, reaching an all-time high of $35 billion. This was the only region to escape the three-year decline (2001-2003) in world FDI flows, and it maintained robust growth in inward FDI in 2004 (more than 40%). Trends in inward FDI to the two subregions have differed somewhat, however, reflecting the influence of various factors. In South-East Europe, FDI inflows started to grow only in 2003. Led by large privatization deals, these inflows nearly tripled, to $11 billion in 2004. In the CIS, inflows grew from $5 billion in 2000 to $24 billion in 2004, benefiting largely from the high prices of petroleum and natural gas. The Russian Federation is the largest recipient of FDI inflows in the region. 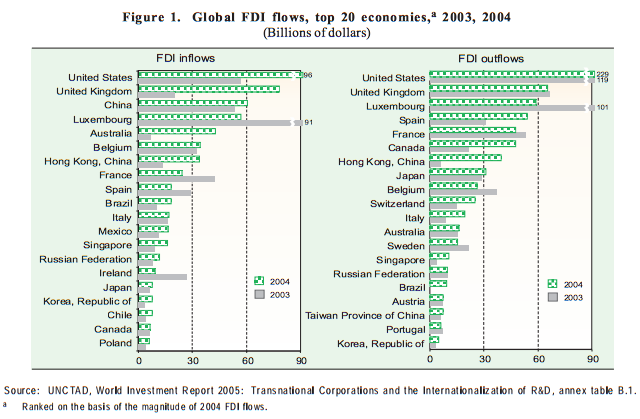 FDI flows into developed countries, which now include the 10 new EU members (see box 1), fell to $380 billion in 2004. The decline was less sharp than in 2003, possibly suggesting a bottoming out of the downward trend that started in 2001. The decline pertained to many major host countries in the developed world. However, there were some significant exceptions; the United States and the United Kingdom recorded substantial increases in inflows mainly as a result of cross-border M&As. Meanwhile, investment outflows from developed countries turned upwards again in 2004 to reach $637 billion. FDI flows into the EU as a whole fell to $216 billion — the lowest level since 1998. However, the performance of individual EU members varied, with Denmark, Germany, the Netherlands and Sweden registering the most significant declines. To some extent the persistence of the downward FDI trend in the EU reflected large repayments of intra-company loans and repatriation of earnings in a few members. At the same time, FDI inflows into all the 10 new EU countries increased, attracted by high rates of economic growth, the availability of skilled human resources at competitive costs and reduced uncertainty with regard to the regulatory framework for FDI following EU accession. Flows into Japan surged by 24% to $8 billion, while those to other developed countries (Israel, New Zealand, Norway and Switzerland) declined. 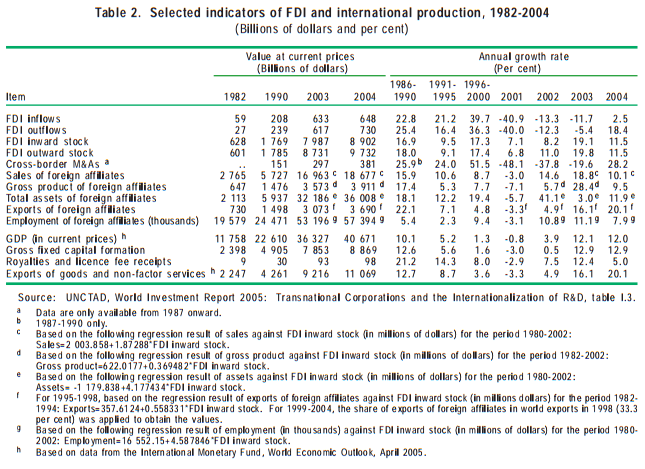 Prospects for FDI worldwide appear to be favourable for 2005. For 2006, global FDI flows can be expected to rise further if economic growth is consolidated and becomes more widespread, corporate restructuring takes hold, profit growth persists and the pursuit of new markets continues. The continued need of firms to improve their competitiveness by expanding into new markets, reducing costs and accessing natural resources and strategic assets abroad provides strong incentives for further FDI in developing countries in particular. Also, the improved profitability of TNCs is likely to trigger greater M&A activity, which should also push up the levels of FDI in developed countries. Surveys of TNCs, experts and investment promotion agencies (IPAs) undertaken by UNCTAD corroborate this relatively optimistic picture, as do the findings of other recent surveys. In the UNCTAD surveys, more than half of the responding TNCs as well as experts and four-fifths of the IPAs expected short-term (2005-2006) growth in FDI flows; very few predicted a decline of FDI in the near future. The competitive pressure on firms, continued offshoring of services, ongoing liberalization and the growth of TNCs from emerging markets were identified as factors that should lead to more FDI. At the same time, there are grounds for caution in forecasting FDI flows. The slowdown of growth in some developed countries, along with structural weaknesses and financial and corporate vulnerabilities in some regions, continue to hinder a strong recovery of FDI growth. Continuing external imbalances in many countries and sharp exchange-rate fluctuations, as well as high and volatile commodity prices, pose risks that may hinder global FDI flows. There is some variation in the FDI prospects of individual regions. In view of the improved economic situation in Asia and Oceania, its important role as a global production centre, its improved policy environment and significant regional integration efforts, the prospects for FDI flows to that region are strongly positive. According to the TNCs, experts and IPAs surveyed by UNCTAD, the region’s outlook for FDI is bright. 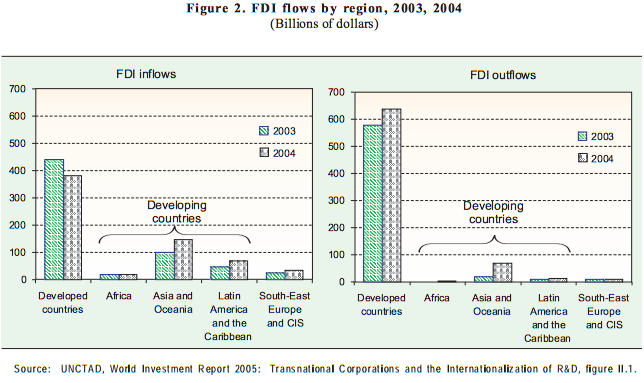 FDI inflows to Latin America and the Caribbean are expected to increase in 2005-2006 as most of the driving forces behind FDI growth in 2004 are set to continue. Prospects are also positive for Africa, partly as a result of higher commodity prices and Africa’s natural resource potential. One out of four TNC respondents expected that inflows to Africa would increase in 2005-2006, suggesting more cautious optimism vis-à-vis this region. FDI inflows into South-East Europe and the CIS are expected to grow further in the near future, based on the expectation that their competitive wages, in particular in South-East Europe, could attract an increasing number of efficiency-seeking or export-oriented projects, while the natural-resourcerich CIS countries could benefit from continued high oil and gas prices. Despite the decline in 2004, prospects for renewed growth in both inward and outward FDI flows for developed countries in 2005 remain positive, underpinned by forecasts of moderate economic growth and a strong pick-up in corporate profits. Already, during the first six months of 2005, cross border M&As in developed countries increased significantly. For the largest recipient country — the United States — prospects for FDI are good, although the inflows may not reach the high levels recorded in 2004.